Don Dietz graduated from San Francisco State University with a Masters of Arts Degree in Education. He taught crafts, graphic arts and drafting for 34 years. After retiring in 1997 he began traveling extensively throughout the United States in his motorhome. He started making stained glass art work "from his studio on the road." His work is inspired by many of the sights he has seen and he incorporates the designs and objects in many of his projects. Don's ability to work with colors and patterns within the glass to achieve the overall effects in his landscapes and subjects makes his work unique. He has done several commissions for homes in Arizona and California and Nevada. His projects have been sold throughout the United States, Canada,England and France. 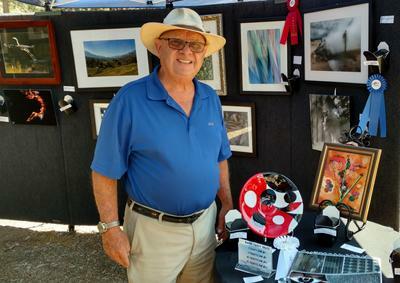 His work has been on display at Artisans Gallery, Idyllwild, CA: Brumleys Gallery, Bass Lake, CA; Yosemite Gallery, Oakhurst, CA; Williams Gallery, Oakhurst, CA; Ween's Gallery, Albuquerque, New Mexico. His work is presently on display at Desert Art Center, Palm Springs, CA., Middle Ridge Winery and Art Gallery, Idyllwild, CA. I have recently expanded into doing Art Glass (Fused Glass) that is Decorative and Functional. The pieces are perfect for gifts - wedding, anniversies and special occassions. Call for an appointment to visit my studio. I accept orders and can ship.